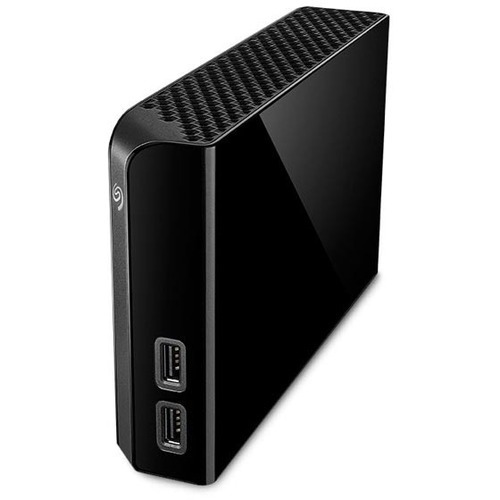 Easy backup with integrated USB 3.0 hub to manage and charge your devicesThe Seagate® Backup Plus Hub drive optimizes external storage with simple local or cloud file backup for your computers and mobile devices- and an intelligent USB hub to charge and manage your USB-connected devices. High-speed USB 3.0 and 2.0 connectivity offers plug-and-play functionality on your PC. The drive is formatted for Windows computers- install the provided NTFS driver for Mac® on your Mac computer, and you can use the drive interchangeably between Windows and Mac computers without reformatting. The two front-facing intelligent USB 3.0 ports amplify the functionality of your drive by allowing you to charge and connect two external devices, like your phone, tablet or camera-even if your computer is in off/standby mode. Via the downloadable Seagate Dashboard software, you are provided with tools for local, mobile, cloud and social media backup. Run a oneclick backup or schedule an automatic backup plan to protect your files in your Backup Plus Hub drive at your convenience. Install the free Seagate Mobile Backup app on an iOS or Android mobile device, and you'll be able to back up all of the pictures and videos from your device to your Seagate drive or to the cloud.